Matomo Tag Manager is the number one open source alternative to …Wait a minute, did you just say TAG MANAGER! That’s awesome, but what is a Tag Manager? A Tag Manager is a centralised management tool that makes it so simple to embed third-party tracking codes to your website without constantly needing access to the backend of your website. Oh right, but I’m still confused? Think of it this way, a Content Management System like WordPress lets you create a website without having the technical HTML or CSS knowledge; that’s similar to a Tag Manager. You can manage all tags easily through one platform to get the insights you want such as tracking form submissions, scrolling behaviours, custom events; the opportunities are endless. Not only this, but by having a Tag Manager, it keeps the code on your website clean, you get the insights you need faster, and it reduces the cost to install and manage such tags in your organisation. This keeps the marketing teams, digital teams and the IT guys happy…It’s a win win for everyone! Click here to try the Matomo Tag Manager now! And as always, the team at Matomo are committed to being the number 1 free open source analytics platform. This means your data is more secure, has less bugs and provides an overall greater impact for your team. Without the Matomo community of talented developers, Matomo wouldn’t exist in a highly competitive market. We encourage you to add some tags and learn why Matomo Tag Manager is such a powerful addition to our Analytics suite. Together we can create an industry leading and complete open source Tag Manager. Currently the Tag Manager is only available as self-hosted but it will be later available on the cloud-hosted installation after the beta. The complete Matomo Tag Manager user guide to get you up too speed as quickly as possible will be available soon. However, the developer guides and integration guides are already available. The source code is available on Github. Be on the lookout for further newsletters and blog posts regarding the Matomo Tag Manager. We will also send out “Matomo Contributor” stickers for every Tag Manager contributor who contributes a tag within the next 3 months. You cannot purchase these stickers anywhere so that’s pretty awesome. But here’s an even better incentive – the top 3 contributors will receive a Matomo hoodie! Simply send us an email at hello@matomo.org after your Tag has been merged. If needed, a draw will decide who gets the hoodies. 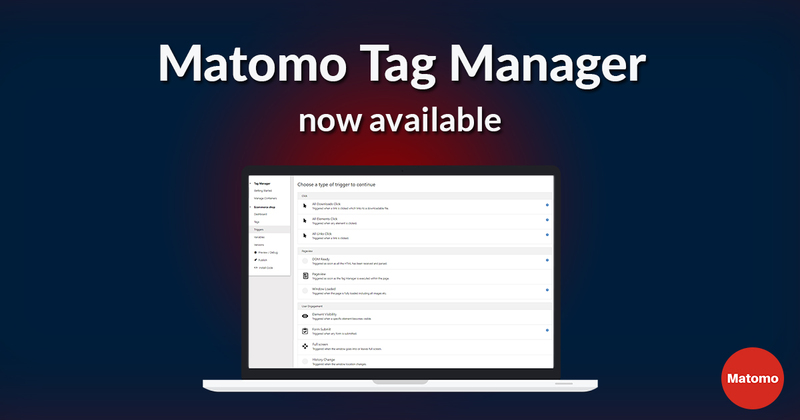 Please share on Facebook or Twitter to spread the word that Matomo Tag Manager is now live!